Yesterday, July 2, 2018, Frank defended his PhD about “Low-Order Modeling, Controller Design and Optimization of Floating Offshore Wind Turbine” at University of Stuttgart with great success! Congratulations to our friend and co-founder of sowento! Frank presenting his PhD topic. 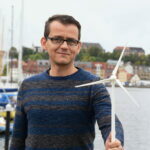 On July 3, 2018, Frank presented the finidings about “Low-Order Modeling, Controller Design and Optimization of Floating Offshore Wind Turbine” of his PhD project and defended his PhD with great success. Congratulation from sowento. Your work is a needed piece in developing floating wind turbines in the future. We as sowento are very happy that you are part of us and hope to transfer your valuable findings into reality, soon. Congratulations Doctor Frank Lemmer! Keep on floating! Frank and the PhD committee.